Robert Gitau and his late wife Rose have been instruments of transformation for many years in the Tala/Nguluni community. They chose to go and live there to plant a church. Finding great poverty caused them to start a school as well and over the past years have mentored and assisted many families and individuals. After their marriage, Robert and Rose began to serve God by travelling to different villages preaching and teaching. Eventually they bought a small plot of land in Nguluni and launched a small church. The church began to grow and they started to not only help the community with spiritual needs but to help economically and physically as well. Robert and Rose adopted many children whose parents had died from AIDS or who had been abandoned. At one stage they took in six orphans when their parents, relatives of Robert and Rose, passed away. Robert and Rose became responsible for raising them along with their previously adopted children. BHW personnel first met Robert in 2002 at a conference. 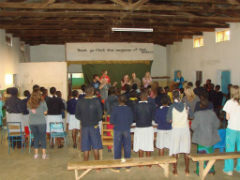 On the next visit to Kenya a visit was paid to the church and school. It was very obvious from the first visit that Robert and Rose were key people and making a significant contribution to their community so an application was presented and accepted to commence funding. This commenced in 2003. Robert and Rose's ministry is based around being available to people. Their home is open 24/7. Each year since 2003 BHW has visited Robert and Rose and observed their ongoing compassion and love for their community. 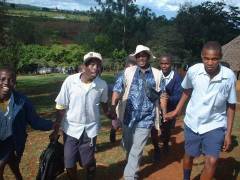 A number of Western young people have gone to stay with them in their home to help with the children in the school. 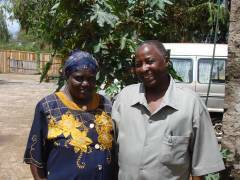 Robert and Rose started a school, a boarding home, built the school buildings and a preschool, put in a borehole for the community, started a clinic, started a micro-finance revolving fund and built extra accommodation at their home for long term visitors who have nowhere to stay. Robert also leads a ministry called Fellowship of Believers. There are a number of churches and church planters involved in this. They have mentored many young people in education, ministry and church planting. Early in 2006 Rose became quite unwell and her eyesight was affected. She was in hospital for two weeks and was finally diagnosed with diabetes. Her blood pressure was very unstable. Because of this she had to slow down a lot. Robert also had to slow down to care more for her. Since then Rose struggled with ill health and in May 2014 she passed away. This was a severe shock for all those involved in the work. However, the team that they were building have rallied around and within weeks were making many of the decisions for the ministry. Robert is the primary beneficiary of this partnership now that Rose has gone. They are extremely generous people and give away most of what they have for the benefit of those to whom they were called to serve. Finances for them and for the work have always been a real challenge. Throughout their ministry they rarely had regular support until BHW began partnering with them. They are key people and Robert will continue to be for the foreseeable future. This partnership is effective, not because of the organised way it is run, but because Robert is a dispenser of grace to all who come near him. Children are being loved, the school is growing and many families are being helped. Along with this, the needs of the community are being met through the church he leads, a clean water well, the clinic, and job training programmes. To allow Robert to continue the spiritual care to the children and the community, trained people have been brought in to run the clinic and school. Robert and Rose invest their lives in the community and are fully engaged. The ministry is operated by the local church allowing the community to be aided not only physically and economically, but spiritually as well. The jobs in all areas are delegated to very capable staff allowing Robert to concentrate on being the chaplain to the school, focusing on the spiritual needs of the children. Robert and Rose were physically childless but they have as many 'children' as it is possible to imagine. Wherever you go in Tala people call out “jambo” to Uncle Robert. Robert is a visionary, there is always a new thing on the horizon. Rose was too, but she was also the accountant. Robert will struggle without Rose there. Fortunately other people are stepping into crucial roles since Rose's death. It is hard to calculate the real needs that Robert has. Apart from the fact that he would be very reluctant to talk about it, he just shares everything he has. As long as he is there he will be helping large numbers of people. The school can be budgeted for and good records are kept but the real needs are those of the scores of people that are being helped. He helps them when there is money, “when the Lord provides”. Robert is relatively unstructured and we do not want this to change. It is important for the morale of the ministry that Robert continues to be assisted in some way. Life was tough before, it will be more so since Rose's death. Supporting him is a very practical way of helping many people and encouraging him. Esther’s mother Rose Dinda lived with Rose and Robert. She was banished from home by her husband and lived there with four of her children. She has four other children also. These other children were educated by Rose and Robert. The two boys have dropped out of high school and are now labourers. The other daughter has dropped out of high school also due to a lack of money for fees. Another daughter has a mental disability due to Rose being beaten by her husband while she was pregnant. This daughter is now in a special school for children with special needs. Esther is seven years old and is in standard three. She is a day student and enjoys school. She likes reading, particularly books in English and her favourite subjects are English and Kiswahili. She enjoys playing with her friends, especially playing football, and her best friend is Sharon. Esther started at CEC school in standard one. She loves school, all subjects, and would like to become an English teacher. She also enjoys helping her mother at home washing utensils and cleaning and would like to help her mum “always”.